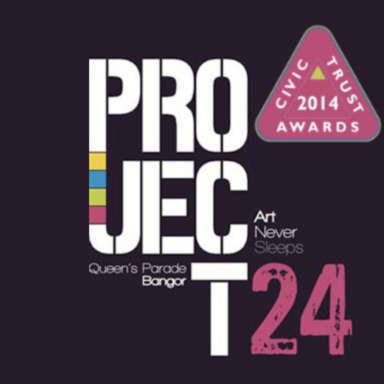 The Hub arrived at Project 24 late Summer 2014 and has proved successful, accommodating a range of events and performances. The self-supporting construction is fixed to the ground and has retractable sides and ends to ensure adequate weather protection with a translucent roof to allow natural light. The space can accommodate a maximum of 150 guests. It can also accommodate tables, seating and staging where required. Project 24 continues to work alongside the local community to facilitate public events. In 2015 we enjoyed working with YMCA, Open House, Abbey Boxing Club, North Down Craft Collective, Aspects Literature Festival and Pickie Fun Park to name a few.